We continue our series sharing summaries of principles The Container Store follows to achieve its long-lasting success. 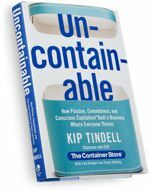 These principles are detailed in the book, UNCONTAINABLE, written by Kip Tindell (co-founder, ceo and chairman, The Container Store). Kip Tindell gives credit to the strong vendor relationships The Container Store has developed as a major reason the company has thrived for three decades. In the early days of the company, The Container Store worked with other mom and pop shops. These small vendors were accustomed to big box retailers making demands and dictating how the vendor/retailer relationship would work. Kip recalls how these small vendors were astonished when The Container Store took a genuine interest in their success. The Container Store takes the time to understand the needs of it vendors and works directly with them to form a mutually beneficial relationship. The Elfa closet shelving system is the best-selling product at The Container Store. It’s a product Kip recalls as being very challenging to sell because it’s difficult to understand how to use it. However, once you learn how to use it, it becomes a simply elegant way to organize a closet. Other retailers refused to sell the Elfa product because it would require too much employee training. The Container Store didn’t shy away from the employee training needed and embraced the Elfa product to the degree that it is by far its most popular product. The Elfa brand and business would never have been realized if The Container Store didn’t develop a strong vendor/retailer relationship. This strong relationship resulted in Elfa being purchased by The Container Store in 1999. Most of the products sold in The Container Store are either proprietary or exclusive. This truly requires a strong vendor/retailer relationship where The Container Store needs to understand how these vendors define success so that everyone wins. With its runaway success, The Container Store saw lots of competitors trying to mimic it business. Local, regional and national chains have all tried to replicate The Container Store business model. None have been able to find the same success and most of these competitors have ceased to exist. Why didn’t these competitors successfully knockoff The Container Store?